During harvest season most farmers work from sunrise to sunset in the crisp fall weather racing their combines through fields of gold. However, some farmers were able to catch a brief reprieve from the busy season for an opportunity to engage with fans that enjoy watching a different type of racing. 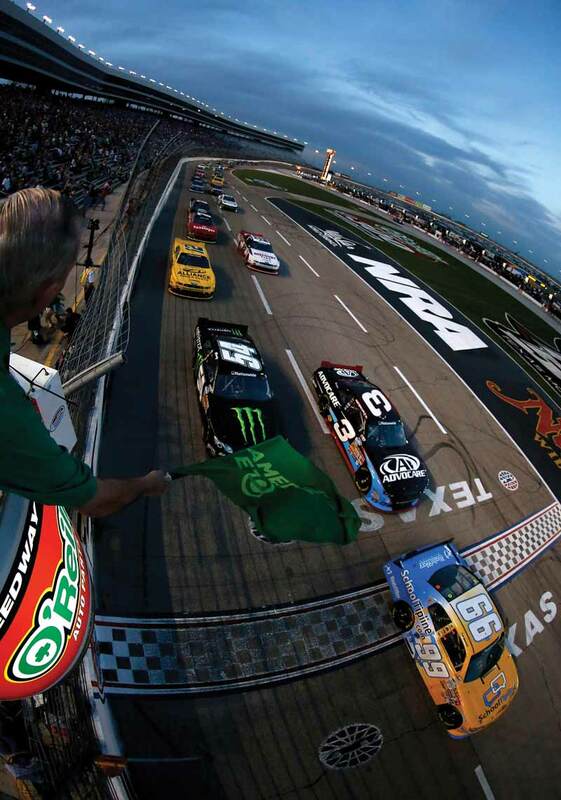 At the beginning of November, farmer volunteers and staff from across the country gathered at Texas Motor Speedway in Fort Worth to talk to NASCAR fans about something every race car needs to make it around the racetrack – ethanol! Texas Corn Producers (TCP) made its way to the NASCAR race weekend, for the sixth consecutive year, to engage with race fans about the agricultural industry. Throughout the promotion, TCP volunteers and staff visited with NASCAR goers about the E15 racing fuel used in the gas tank of every racecar, and how it ultimately burns cleaner than any other currently available fuel source. Not only does ethanol reduce greenhouse gas emissions to create cleaner air for everyone to breathe, but it also decreases the use of non-renewable natural resources. “As the years have gone on, the Texas Corn Producers’ desire for the NASCAR promotion has been to educate. So we look at this event as a way to engage with our urban families that buy food, fuel, and clothes every day and teach them about American agriculture,” Wesley Spurlock, a TCP director and farmer from Stratford, said. Thousands of guests visited the large exhibit at the track’s Midway during the weekend’s events. The #PoweredByCorn exhibit, hosted by TCP and American Ethanol, included a tractor from Holt Agribusiness, Texas Farm Bureau’s harvest experience and mobile learning barn, Austin Dillon’s #3 show car, and the biofuel mobile education center. Each element of the display allowed farmers and volunteers to engage in conversations with consumers. Volunteers answered questions regarding today’s farming practices and demonstrated how corn is used in the feed, fuel, and fiber industry everyday. Krista Willis, a third-time volunteer for the event and Minnesota farmer, spent the weekend sharing her farming experiences with fans and explained to consumers how corn makes it to their gas tanks and grocery stores. “Throughout the years at NASCAR we have had the opportunity to talk with consumers and help them make the connection of how corn is used to produce ethanol products, and also used to produce DDGs at the same time that help feed livestock – and in the end, produce a good steak that we all like to eat,” Willis said. As NASCAR fans learned about family-owned and operated farms, safety, innovation, and sustainability, they also gained the chance to be entered in prize giveaways throughout the weekend. While fans raced through the exhibit to be entered in the giveaways, volunteers cruised through the campgrounds and infield to strike up conversations with campers about the renewable fuel, where it comes from, and the role it plays in our society. As volunteers engaged in conversation with the campers they also gave away a tremendous amount of American Ethanol green starter flags, which could be seen all the way from the TCP Loud & Proud Pre-race Show powered by American Ethanol. The concert featured one of the country’s most popular Texas country music artist, Josh Abbott Band, and drew in a great crowd during the weekend-long promotion. TCP amped up the excitement by sending radio stations across the state concert and race tickets to be given away – as well as ethanol and agricultural trivia to grasp the interest of listeners. The event gained a considerable amount of presence not only on the track, but throughout the entire state from radio stations taking part and giving away the tickets to listeners. The weekend allowed TCP the opportunity to gain an even bigger outreach and educate thousands about the importance of agriculture, the different uses of corn, and benefits of ethanol. The 2018 promotion at Texas Motor Speedway was a huge success and couldn’t have been done without all of those who took the time to come out and volunteer!